I have told the story before. As a child, my family owned a vacation home on the Oklahoma side of Lake Texoma. We made the drive down from Oklahoma City literally thousands of times over my seven-plus decades. That property was passed down from my grandfather, to my parents, and then to me. When the time comes, that same property will be my retirement home. Growing up at our lake home, tuning the radio across the dial, I heard radio stations from faraway—and nearby. One of those radio stations was at 1500 on the AM dial. Today, that station is KJIM-AM. Our new radio station went on the air, at 101.3 FM in 2018, adding day-and-night broadcasts of music, weather, and the most comprehensive local news on radio. 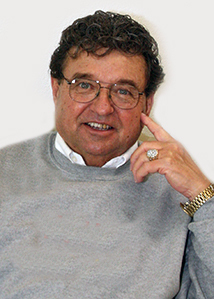 Many, many, years ago, listening to 1500 AM during those lazy days of summer, I realized that spot on the radio dial was a touchpoint for a lifetime of memories. That’s when I decided to call the radio station “The Memory Maker.” Hopefully, our music and features have sparked a few memories that are important to you, too. 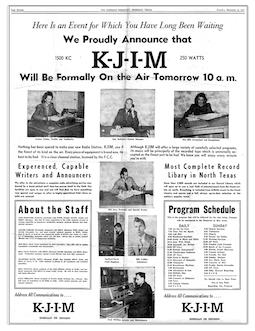 Since December 9, 1947, KJIM has been broadcasting at 1500 on the AM radio dial, in one form or another. It was Sherman’s first commercial broadcast station. Its original programming was classical music and the radio station, over the years, offered a variety of formats. Now, 70 years later, KJIM-AM’s sister station KJIM-FM, is the area’s newest radio station at 101.3 on the dial. KJIM-AM 1500, The Memory Maker, joins with KJIM-FM 101.3 to provide North Texas with The Best Songs on the Radio, 24 hours a day, 7 days a week. 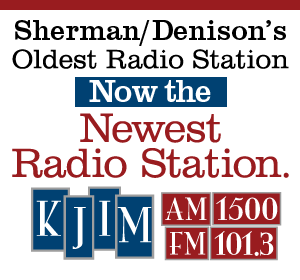 KJIM Radio in Sherman/Denison, Texas is the most-listened-to radio station among adults 35+ in the Texoma region of North Texas and Southern Oklahoma. 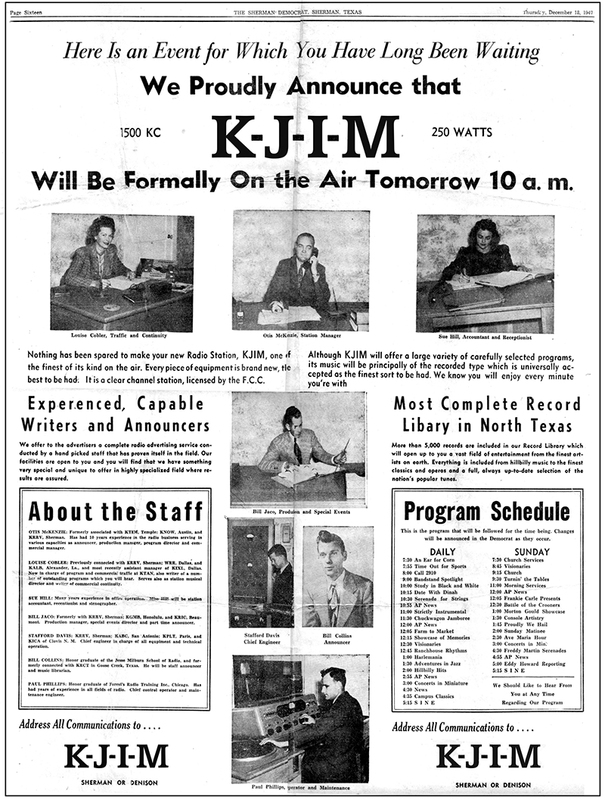 KJIM-AM 1500 went on-the-air on December 19, 1947 and served the area continuously with live, local news, regional weather, and national and international new from CBS Radio. KJIM-AM 1500 has been serving the community with a consistent format of adult standards, local and national news. Our signal reaches over 5-million listeners. KJIM-AM & FM is proud of its long history of community service and offering a unique style of programming for its adult audience. 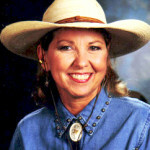 Waynetta Ausmus has been hosting her Sunday morning radio show"Storytime" from "The Luck-Me Ranch" for over 15 years. The eclectic collection of cowboy songs, poetry and yarn-spinning is a favorite respite for its loyal listeners. CBS Radio News Who's Behind the Voice? There is an industry joke, "You have a great face for radio." In fact, a voice can be very different from the person you might expect to see. So, it's always fun to connect a face with a familiar voice. 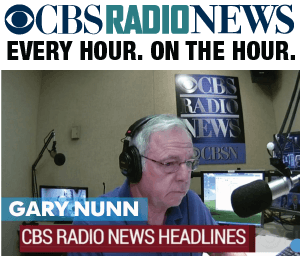 See who is behind the microphone at CBS News.